France, 2004, 125 minutes, Colour. Romain Duris, Kristin Scott Thomas, Pascale Greggory, Eva Green, Robin Renucci, Marie Bunel. Directed by Jean- Paul Salome. 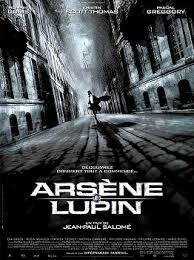 Arsene Lupin seems to be the equivalent of Sherlock Holmes in late 19th century French popular novels. However, he is not a detective. Rather, like Raffles, he is a skilled and suave burglar, a gentleman-thief. The author of the many Lupin books, Maurice Leblanc, published his first in the series in 1905 – and in 1908 created a confrontation between Holmes and Lupin. Leblanc died in 1941. Over the decades there have been several film versions and many Lupin series for television. This film is a lavish re-creation of the late 19th century and the period before the outbreak of World War I. No expense has been spared to make it look good, costumes and décor and the transition from a horse and carriage world to that of the bicycle and the car. A prologue set in 1884 introduces us to Arsene, the son of a martial arts trainer in an aristocrat’s house. Arsene’s father falls foul of the master for robbery but not before he has urged his son to be a skilful thief. He is then found dead after a police chase. The adult Arsene (Romain Duris) is shown charming the ladies and surreptitiously relieving them of their jewellery, even in the middle of elegant soirees. He is also expertly acrobatic in his escapes. When he meets the daughter of the house, his childhood playmate, Clarisse (Eva Green), at his mother’s deathbed, he falls in love but also decides it is time for revenge on her father. He returns as a fencing instructor and is soon caught up in all kinds of plots. A secret group of Royalists are plotting to remove the government. A gentlewoman thief and spy (Kristin Scott Thomas) is condemned to death by the group but rescued in the nick of time by Arsene who is beguiled by her. They are observed by a wily member of the group (or double agent) who has his own dark secret to be revealed at the end (Pascal Greggory), and what follows is a series of escapades, robberies, duels, betrayals. It should be said that it is all done with a spectacular touch but also a light touch, a kind of 19th century swashbuckling tone. By the end, however, it becomes very serious as Arsene, the gentlewoman and the agent confront each other. And just when you thought it was all over, there is a tongue-in-cheek episode in 1914 involving assassination attempts on archdukes. Clearly, an entertaining romp for French audiences. Entertaining for those who enjoy Gallic insouciance! 1. A popular French character? In literature and film? From the 19th century into the 20th century? Swashbuckling adventures? The Dumas… tradition? 2. The popularity of the novels, action, this film as a combination of several stories, becoming a film of a string of episodes? 3. The period, the 1870s, the countryside, mansions, costumes and decor? The move into the 1990s, change, modernity, the old and the new? 1913, a period of change, mechanisation, pre--World War I? 4. Arsene and his childhood, his bond with his mother, the boxing training with his father, the father alerting him to be on his toes? The aunt and her husband, aristocracy? Snobbery and disdain? Clarisse, his cousin, the bond with her? The sessions with his father? His father’s arrest, the father’s flight, his advice to his son to be always alert, he and his mother leaving the mansion? Finding the burned corpse of his father and its effect? 5. His adult would: his identity, created, using his father’s advice, his place in society, a fop, his pretending to be a policeman at the dinner, his clever stealing of the jewellery, the chase, his escape, the woman who recognised him and let him go with her sense of adventure? An introduction to his character? 6. His career, interactions with the police, his meeting Clarisse again, the revelation of who he was, the bonding with her, the effect, her pregnancy, the birth of the child? His being in and out of her life? His disguise and meeting her, meeting her father, his decisions, fidelity? Clarisse and her love for her husband, the confrontation with Josephine? Her being killed? 7. The Cardinal, the issue with the crosses, stealing them, the maps of the abbeys, identifying the places, the nobles in attendance to the Cardinal, relationship with the King? Anti-Republican? 8. Beaumagnan, is different identities, a rogue, even as a priest in a missionary, seduction? His relationship with Josephine and working with her? 9. Josephine, her being captured, tried, considered which, whether in the paintings in her resembling her mother, the stealing of the crosses and assembling them? Her being thrown into the water, rescued by Arsene who had heard everything? The confrontation with the Cardinal, his burning? 10. Josephine and her fascination with Arsene, the effect of the rescue, the ring, information, their work together, the growing rivalry, love and betrayal? 11. Beaumagnan and his relationship with Josephine, the pursuit, with Arsene, the revelation that he was his father? Arsene and his reaction, the shock of the evil of his father? His going to see his mother, in the institution, her death? 12. The sequence of the lighthouse, the cliffs, Beaumagnan and his death? 13. Josephine, jealousy, betrayal, wanting to kill Arsene? 14. Arsene, the map, his ingenuity, the place of the crosses? 15. The transition to 1913, Josephine and entangling Arsene’s son in her plans? In the square, the denunciation? The hypnosis? The cross? The final confrontation with Josephine and Arsene’s victory?